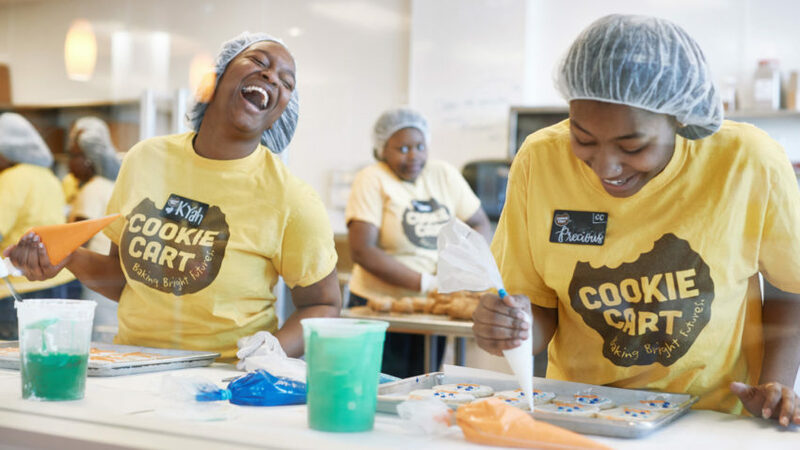 June’s Positive Change recipient is Cookie Cart, a nonprofit organization that provides teens ages 15 to 18 years old with lasting and meaningful work, life, and leadership skills through experience and training in their urban bakeries. Cookie Cart has been providing teens with these opportunities at their North Minneapolis bakery in a safe, secure, creative and engaging environment since 1988. Working cooperatively with neighborhood leaders, Cookie Cart recently converted a vacant building at 946 Payne Avenue (very close to our East 7th store!) into a vibrant learning hub and bakery this past May. At this location, East Side neighborhood teens can take part in hands-on employment training, classroom skill development and leadership workshops. Knowing that teens learn best through doing, Cookie Cart’s nonprofit bakery is designed as an incubator. Teens are involved in cookie production, managing inventory, leading teams, and providing customer service. As a first job, teens earn while they learn at Cookie Cart. This provides an important economic benefit to families and the neighborhood. On-the-job experience is paired with workshops on communication skills, customer service, conflict resolution, and work success skills to empower teens with the tools needed to overcome educational and employment barriers. Through both classes and bakery experience, teens build and strengthen the skills necessary for a strong and successful career path. Donations raised in June will support East Side teens participating in the new bakery and learning hub’s “earn-as-you-learn” program where they get paid to work while receiving classroom training.